QUESTION: Mr. Armstrong; You state that we are headed more toward a totalitarian state rather than fascist or communist state. I assume you are suggesting the NSA has gone so far they have lost the cooperation they once had as CISCO sent a letter to Obama and Microsoft is losing ground outside the USA because of the NSA. Is this new form of totalitarianism you suggest entirely new or has there been such trends in history before? ANSWER: Good question. Fascists advocate a mixed economy were there is still private ownership yet the principal goal is to achieve a secure national self-sufficiency and independence whereas Communism the state owns all industry. Fascists have typically aligned themselves with industry who see protectionism to be to their advantage and support an interventionist economic policy. That view emerged in World War I but it really took hold with World War II. We already have had this trend to some extent with cooperation between government and various corporate groups especially bankers. The bankers used WTO to sell their products though trade. The term fascist has varied meanings that are not always clearly defined. Normally, people on the surface tend to infer a strong leader at the center like Hitler, but this is a loose term that has been used pejoratively primarily by political opponents. The difference between a simple fascist state and the next in line would be a totalitarian state is primarily the lack of cooperation of the private sector. Both can have a dictator or merely an organization with a leadership that may not be identified by a single person. The fascist state will often be influenced by an oligarchy behind the scenes as was the Roman Republic that led to the Civil War with Caesar. However, both forms of fascism and totalitarianism typically have an inner cancer of corruption that moves through the state. Our legal system is caught between these two states right now. If a private person sued the banks in NYC, they lost and many class actions suits were dismissed, which is the classic fascist state model. However, when the government goes after a bank, the bank cannot win and that is more in the category of a totalitarian state where our conviction rate is 98%+ in federal courts. If we look at the three competing forms of government that existed in Northern Italy we can see how all three functions and what was their duration and why Genoa beat Venice and Florence economically. Venice was the totalitarian state where it owned the fleet etc. It was not Communism for you could still acquire your own property and assets as well as choose your profession. However, the state-owned the fleet and there was only one bank run by the state. 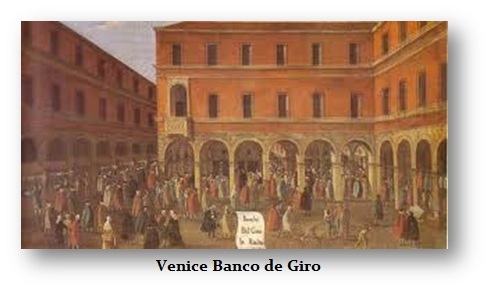 Yet, Venice is where giro banking reemerged – the ability to transfer money between accounts without having to physically withdraw to pay a third party. The Venetian Doge was a life-time position, yet upon his death, the estate was seized and everything he did was scrutinized to reverse any corruption. The legal system devolved into a deplorable state as we are moving towards. 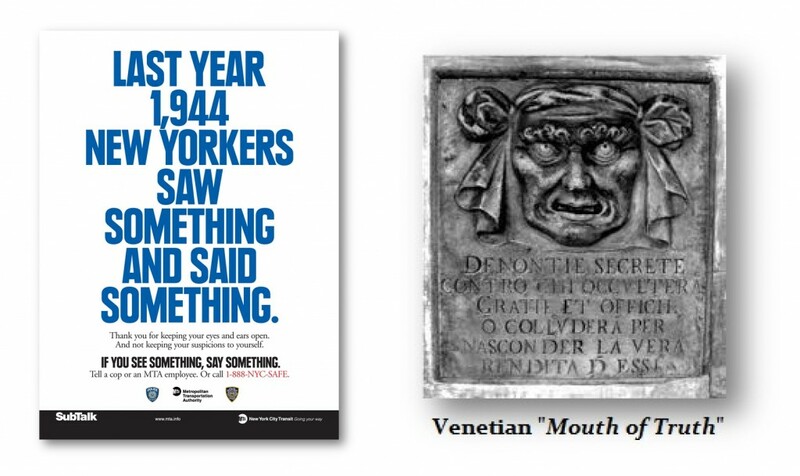 We have the “See Something Say Something” campaign whereas Venice had its Mouth of Truth. People could say anything about anyone and slip into the slot entirely anonymously. This led to massive corruption where people used this mechanism to strike at rivals etc.. Once someone dropped a slip, that was it. It was presumed to be true and you would often be tortures until you confessed. Shakespeare’s Merchant of Venice and the pound of flesh comes to mind as well. 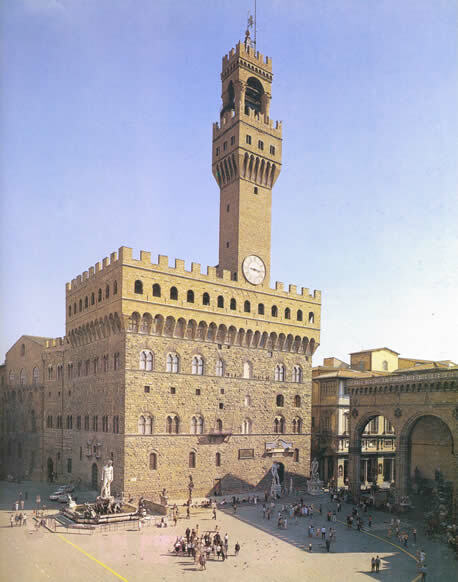 Florence was more of a fascist state where the bankers ruled. It was a republic that was simply corrupt and steered by the rich bankers. This led at times to massive revolts and they hung the bankers and set fire to their palaces during the Political-Economic Revolt of 1343. 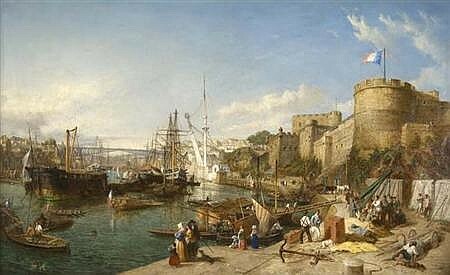 The only Republic that did not transform into an oligarchy was that of Genoa. There the richest families ruled, but each rotated as the Doge for one year. Thus, they never became Draconian for they feared retaliation the next year and they would be subject to their own laws. Career politicians are always exempt under our current system. Genoa did not fall into a rich v poor, it was business always that benefited the entire city for it perpetually competed against Florence and Venice. You simply cannot have career politicians – NO EXCEPTIONS! The typical definitions of republics, fascism, and totalitarian states are all shy of the Marxist view that leads to socialism and communism. People who try to just generalize do not understand their history. It is like market. Just because they rise does not guarantee it is a bull market. Those who try to simply define republic v fascism are far too general. We are headed toward the totalitarian state BECAUSE of the national debts. The NSA has pushed us beyond the fascist category of cooperating with the private sector in what was called the great military complex that Eisenhower warned about. We are seeing the gradual default on pensions etc, and therefore that begins with fascism where the shift becomes the state first, people second. Fascism marks the movement away from socialism. In our case, the unfunded liabilities are far too great and thus we are moving away precisely as the early stage of any fascist state. Nonetheless, the government realizes it cannot just print money to sustain power and thus we get the hunt for taxes and the departure from socialism. This is why as say it is NOT Capitalism that is in its death-throes, it is Socialism. The state will not honor its obligations. That pushes it into the final confrontation against the people and hence we move to the third stage of totalitarianism where corporations and banks lose their influence under a republic and a fascist state. Corporations and bankers suddenly find themselves the targets indistinguishable from the people. Hence, we are seeing huge fines now against the banks. This is a complex topic and can be the subject of an entire book. I have about 1,000 pages written so far going through the various governmental forms and experiments over thousands of years. To put this simply, only a fool thinks there are just plain types of government that can easily be defined such as democracy, republic, fascist state, and Communism. There are a lot more flavors to the complex political experiment of humankind.